Sets the bar very, very high. The SONOS PLAY:3 is the best speaker that the company currently makes, and easily one of the best wireless speakers available today. In terms of combining great sound, good design, and absolutely fantastic usability - all for a knockdown price - it remains unbeaten. And this, by the way, includes the company’s recent smart speakers that incorporate Amazon Alexa. In this review, we break down the PLAY:3’s sound, design, packaging and accessories, specs and more. To see how it stacks up, see our list of the best wireless and Bluetooth speakers. We’ll talk about the design of the SONOS PLAY:3 and the way you set it up further down. But you can’t talk about the sound of the speaker without talking about Trueplay. This is SONOS’s proprietary technology for tuning the speaker to the space you put it in, meaning that you get the ideal sound for your room. The idea is that the speaker analyses a test tone being played back while you move your phone around in a weird sort of ritual dance, in order to adjust the sound so it’s perfect for the room. We tried the speaker out in multiple rooms, including a bathroom, tiny apartment kitchen, living room and home office, and despite recalibrating for each location, we’d be hard pressed to say there was an appreciable difference. It’s entirely possible that TruePlay becomes more useful with multiple speakers - connecting multiple SONOS units to each other is dead easy, using the app - but it struck us as more of a gimmick than anything else. It’s also, for the time being, only available on iOS, not Android. That’s an oversight that should have been corrected by now. Fortunately, the minimal impact of the Trueplay process doesn’t diminish the overall sound of the speaker, which is terrific. The bass is huge for the speaker’s size, clear and rounded, distortion free even at high volumes. In the guts of the system, there are three Class D amplifiers, a type known for its raw power. They do their work through three speaker drivers and a bass radiator, and the system supports just about any sound file you can throw at it, from compressed MP3s to full lossless audio. The sound isn’t delicate or elegant, more appropriate to thumping tunes than picked folk, but it’s hard not to love a system that can deliver great sound at any volume, and the PLAY:3 easily beats out bigger, more expensive speakers like the Bryston BryFi (full review here). SONOS doesn’t give out wattage figures - wattage determines, loosely, how loud a speaker can go when pushed - but the BryFi is 75 watts per channel, which is substantial, and the SONOS more than matches it. It’s also about eight times less expensive - $249, at the time of writing, to the BryFi’s $1,495! There’s a kicking level of stereo spread, and some excellent, nuanced detail in the mids and highs. That’s not always a given with wireless speakers, many of which don’t even offer stereo sound. And while the SONOS PLAY:3 isn’t going to set the world on fire, in terms of crisp detail, it more than matches up to other speakers in its price range. Compare it, for example, to the Bose SoundLink Mini II. That speaker, while around $60 cheaper than the PLAY:3, doesn’t look half as good, and in our opinion, has sound that doesn’t quite match the audio that the SONOS speaker puts out. We really appreciated how the instrumentation was separated within the music we listen to on the speaker, and how easy it was to pick out different elements of the mix. You definitely aren’t talking high-end audio here, but the PLAY:3 doesn’t take anything off the table – and as we are about to see, even if you did have a problem with sound, you have to give it up to the design. It’s simply phenomenal. At the time of writing, SONOS have their newest speaker out, the SONOS ONE. It’s cheaper (by about $50) and smaller than the PLAY:3, and crucially, includes the Amazon Alexa assistant built in. This means you can control music with your voice, as well as getting it to do mildly useful things like read you a recipe for chicken stock. The PLAY:3 currently on the market does not have this functionality, and right now, we don’t know when a new version will be released that includes it. We will review it when one comes along, but if you want smart speaker functionality, then you should look at getting the smaller SONOS. It should fulfil your needs for now. If there’s one real failing to the PLAY:3, it’s that it doesn’t really do enough to distinguish itself, design-wise. It rests on the idea of a wireless speaker as a small grey box, with only minor flourishes. The most obvious of these is the asymmetrical design, with the speaker grille on the front a different size to the rear end. This makes for an eye-catching design when viewed from the side, but it doesn’t really do enough to distinguish itself when seen from the front. The one thing we do like about the design, however, is the lack of controls – it sounds counterintuitive, but bear with us. The aforementioned app is so well-designed that you almost never need to rely on the physical buttons on the unit, which are limited to a play pause button and two controls for volume. These work very well. They are also distinct from SONOS’s bigger speaker, the PLAY:5, which uses touch controls. Those are nice to have, given the brilliance of the app, a little superfluous. If we had to pick, we’d say choose the PLAY:3 over its bigger brother, which is more expensive ($249 to the PLAY:5’s $499). There’s not a huge difference in sound, just volume, and the only thing the bigger model has going for it is the inclusion of an auxiliary input, which the PLAY:3 does not have. This means that you need to buy the big one if you want to make any physical connections between it and, say, a separate player. This definitely isn’t a deal breaker, by any means – just something worth bearing in mind. The only connection on the back of the PLAY:3, other than the power jack, is an ethernet connection for when your Wi-Fi goes screwy. There’s also a wall-mount bracket, which is nice to have, positioned in the center among the dotted bass ports. SONOS have always been good with their packaging. Not just in the sense that it’s attractive, but in the sense that it’s really been built for human beings. Most amplifiers – and indeed, most wireless speakers – come in basic cardboard boxes that you’ll forget the moment you turn away from them. The PLAY:3 is a little bit different. The black box not only looks good, but has an intelligent set of instructions on the outside, which mean that you almost don’t need to refer to the included manual. The company is really good at not only designing good packaging, but also to keep returning to it. 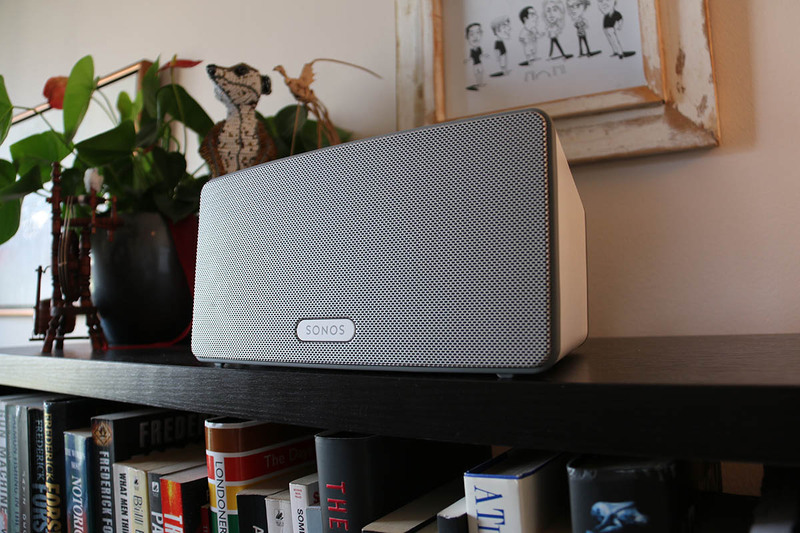 The box for the recent SONOS PLAYBASE (full review here) was brilliant, and something we’d like to see more of. You really don’t get a lot of accessories with the PLAY:3. Outside of a standard power cable, the only other accessory is a simple ethernet cable, which most people probably won’t even use. It’s the kind of thing that will almost certainly land up in the tool draw in your house – you know the one, where you keep spare batteries and screws and weird zip ties and drill bits. Every house has one, and we guarantee that you’ll rediscover this cable in 20 years, and be completely unable to remember what it came from. Beyond that, you get a simple, well-designed manual…and that’s it. Nothing we didn’t expect to see, and no significant absences, either. The Play:3 has one of the best and easiest setup experiences we’ve ever been through. The app is genius. It offers near instant access to virtually any music streaming service you can imagine, and several you can’t. The sound is incredible for the price, with rich bass and decent detail. The design is a little bit dull, and is unlikely to stand out. ​We wouldn’t recommend buying the speaker if you have models from other manufacturers, as it simply will not integrate with them. If you don’t feel like being locked into the SONOS ecosystem, then its closest competitor in the space is probably something like the Bose SoundLink Mini II. In our opinion, the PLAY:3 is a far superior speaker. It might be a little pricier - $249 to the SoundLink’s $180 - but that’s not a huge difference. It also offers a much better user experience, with setup and usability that leaves the Bose speaker in the dust. That being said, the Bose does have a couple of things going for it that the PLAY:3 does not. It uses Bluetooth as well as Wi-Fi, and is a lot more portable. This means you don’t have to be limited to using it inside your home. We know which speaker we’d pick, but this is still a viable alternative. If you want an alternative option for dedicated home wi-fi speaker, then we recommend trying out the Denon Heos 1. Again, we think the PLAY:3 is superior here, but Denon have made a valiant effort to create an alternative, and we think it’s definitely worth a look. We like the design, and the speaker also includes a USB port, giving it a little bit more functionality than the model from SONOS. Price-wise, it’s even cheaper than the Bose, at $179, but you definitely get a hell of a lot more for your money if you spring a little bit more for the PLAY:3. And if you want to spring quite a bit more, then why not get something really meaty, like the Naim Mu-So QB? At $800 at the time of writing, it’s much, much more expensive than the $249 PLAY:3. But you do get what you pay for, and what you pay for is a speaker with absolutely brilliant design, world-beating sound, and stunning functionality. Naim make some of the best audio equipment on the planet, and the QB is the smaller, more budget friendly version of their elegant Mu-So. If you do have the money to spend, we can strongly recommend you spend it here. As we mentioned, the PLAY:3 does not come with smart speaker functionality. For that, you’ll need to buy the SONOS ONE. Having tested one, we don’t think it’s worth it. Not yet, anyway. Right now, Alexa isn’t nearly as useful or as clever as she should be, and since the SONOS app is absolutely brilliant anyway, it makes far more sense to pay a little more for the much better PLAY:3. The ONE is based on the old PLAY:1, with Alexa bolted on, and although the touch controls might be nice to have in certain situations, we think there’s still quite a bit of work to be done here.